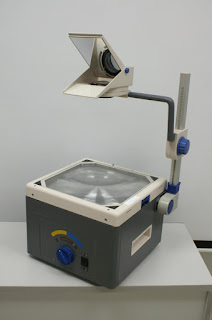 I have harped on this topic before but shall stress it again: when it comes to teaching, an overhead projector is far more useful than that odious tool known as PowerPoint. Now I know there are people who will point to various ways in which you can write or draw on a PowerPoint slide but none of them is as simple as using a wax pencil on an acetate sheet on an overhead projector. Why is that important? Because the ability to provide a quick illustration in response to a student's question is part of dynamic teaching. You don't just feed prepared slides to your classes. You engage, listen, and elaborate on various points. With a small audience, you can always use a flip chart or a white board (and it was a sad day when chalk boards left the classroom but I'll save that rant for another time) but with a large audience, the overhead projector puts PowerPoint to shame. I can recall the early days of the mad rush to PowerPoint. It reminded me of the 1970s when otherwise sane people suddenly thought bell-bottoms were high fashion. It has been decades and their credibility is still suspect. PowerPoint was likewise hip and cool because it was, well, hip and cool. If you pressed them for explanations they became suspiciously vague. They then went on the attack and anyone who resisted the PowerPoint trend was mocked as a Luddite, a mossback, and a cave-dweller. Such attacks revealed the weakness of their case. Those attending my next workshop on how to make presentations to councils and boards may be in for some time travel. They will see the usual PowerPoint slides and advice but hold on: another device may make a surprise appearance.